Note: Previous entries in the series are posted here. Q – Would you consider your work ‘conservative’ and if so, how, and why? A– I would consider it conservative. It seeks to advocate for the apostolic deposit as received in Scripture as normative for the church for all time, with it understood that further theological reflection on that deposit can help clarify it. This is the classic view in early Christianity and was the view of the Protestant reformers. I am seeking to recover and articulate afresh the apostolic understanding of faith, works, and the gospel of Jesus the king for today. The idea is not to repristinate, but to reappropriate these ancient concepts authentically in light of our contemporary contexts. Yet some will feel that I am a radical (or maybe even heterodox) because I am calling into question elements of traditional Reformation-era theology. Although as a Protestant I am deeply gratefully for Luther, Calvin, Zwingli, Hubmaier, and other courageous early reformers, we need to be careful that we do not elevate Reformation-era theological conclusions beyond what is warranted. Fidelity to the Reformation means maintaining the Reformation’s own emphasis on sola scriptura, not that we seek to freeze Reformation-era theology, so that we can microwave it for dinner in today’s postmodern world. If Reformation-era ideas about “faith” and “grace” prove slightly off-target with regard to the biblical evidence, then we need to contend for ongoing revisions to our theological systems as fearlessly as did they. Q – Why is it that you include Calvin and Luther in your consideration but not Zwingli, who had a great deal to say in his ‘On Divine and Human Righteousness’ concerning salvation’s what and how? A– Who is Zwingli? Isn’t he a hockey star? Truly our friend Huldrich is the ugly neglected step-child of the Reformation, is he not? 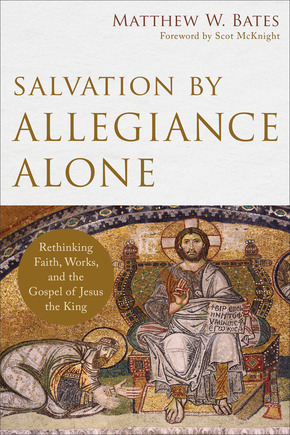 You will actually find very little on Calvin and Luther in Salvation by Allegiance Alone, so I wasn’t picking on Zwingli. Reformers are mentioned to add interest or provide context in a couple places, but their footprint in the book is tiny. This was a deliberate strategy. The problem with writing a book on salvation theory is that many readers loudly proclaim sola scriptura, but actual want something considerably different in such books. What are they really after? Readers passionately want to hear that their Christian tribe really and truly got it right. Sadly I’ve been forced to conclude that some would prefer that to the actual truth itself. Secondarily, readers desperately want to learn what Christian tribal team the author belongs to. Is this guy or gal Catholic, Protestant, or Orthodox?—If Protestant, a Lutheran, Calvinist, radical reformer, an Arminian, a fundamentalist, a NPP advocate, an evangelical, a liberal? As an author, my sense is that many want to know this so that they can pre-judge arguments before even hearing them. I tried to curb this by framing the book in such a way as to undercut confessional boundaries from the outset. Books on salvation theory that treat the Reformation can also get bogged down on internal squabbles and never get to the heart of Scripture’s teaching. An author says “xyz” about Luther, and someone shouts, but we need to qualify that because Luther also said “zyx”! (And this is easy to do since Luther said anything and everything). And statements about Calvinism are sent packing because Calvin himself said something different than his later disciples. In such books energy tends to spiral inward on Reformation-era disputes and contemporary denominationalism, and then to dissipate before really getting to the Bible itself. By sidelining the Reformation, including our friend Huldrich, I was hoping to alleviate these problems. I wanted to force the reader to deal with Scripture alone in the raw to the degree such a thing is possible. At the end of the day, however, we shouldn’t be hermeneutically naïve in thinking we could or should ultimately neglect the many valid insights of the Reformation era. But many other books explore such things; readers may allow that mine need not do it too. Q – Do you have plans to offer further thoughts on the subject as part of a larger ‘systematic theology’? A– I suspect I will write another book on salvation theory sometime in the future. I doubt it would be a full-scale “systematic theology.” I won’t say “never” though, especially because I am still an early career theologian. I am saying “early career” to make myself feel better—as I have peaked in other ways¬. I turned 40 this year. Thanks, Jim, for the excellent questions and dialogue. I’ve enjoyed it.